Dense thicket forming, prickly shrub with stiff upright stems and stiff, pointed ovate to lancealote 'leaves'. The leaves are actually cladodes (or cladophylls), flattened green stems rather than true leaves. Small greenish-white flowers in spring, produced from the centre of the cladodes. 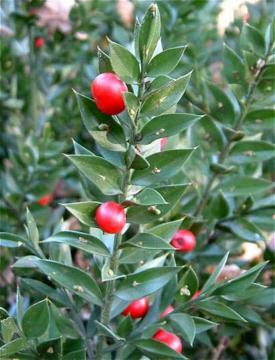 They are followed by bright red berries on female plants. Tolerant of deep shade and almost any well drained soil. Will grow in dry shady positions, also on shallow chalk. Resistant to honey fungus. From seed, which can be slow to germinate, or by division of rooted suckers. Good as an evergreen underplanting on dry ground underneath tree canopies such as a woodland edge. Medicinal herb used, amongst other things, for the treatment of haemorrhoids and varicose veins. Known to the Greeks and Romans, described in 60 BC. by Pliny for the treatment of varicose veins and still in use today. Mainly native to southern Europe and the Meditereanean area but also occurs further afield, including southern Britain.